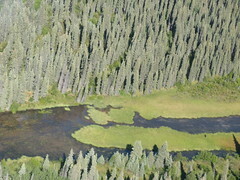 Tom took me on a reconnaissance moose flight Satruday. We flew just over 100 miles North of Bethel to the spot that Tom, Mike, Buzz, and Fred will be hunting next week. Tom was looking for lakes that were long enough for the float plane to land on. The boys are chartering two Beavers to drop them off with 2 rafts. My job was to photograph the lakes and any moose seen. We saw 2 moose and 2 Grizzly Bears. You can just make out the brown dot in the vegetation in the bottom left. It was a beautiful day to fly. I got to see the Yukon River and the Andreafsky Mountains. Tom let me fly the plane for a few minutes too. I tend to list to the right.